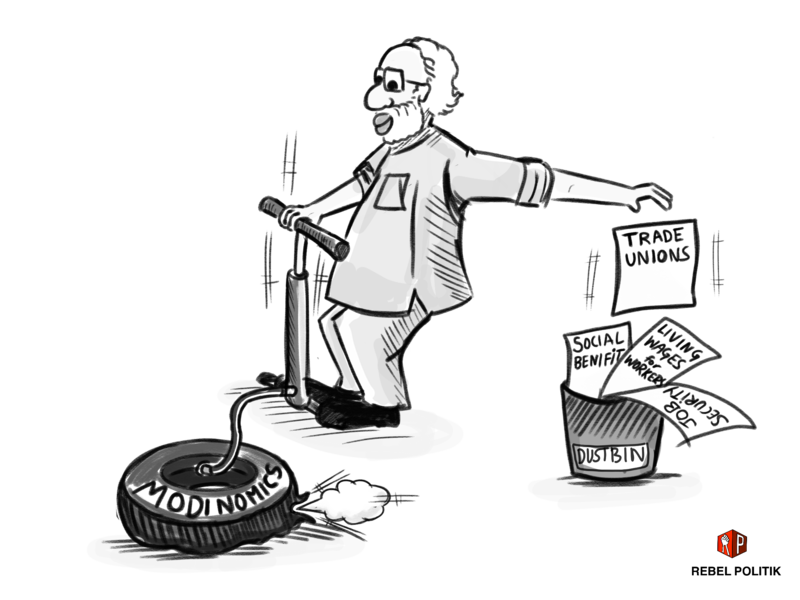 This is the second of a series of short articles on Economics with an intention to demystify various basic terms and concepts related to Economics that we encounter everyday in news papers and other media forums as well as our conversations. And yet, these terms and concepts may not have been entirely clear to some of us. This, on a macro level, allows a leeway to governments and the corporate sector to mislead us into believing wrong information regarding development and our own socio-economic welfare. Prime Minister Narendra Modi rode to power promising 2 crores jobs per year to unemployed youths during his election campaign. Recently his comment that selling Pakodas can be a viable employment opportunity for jobless youths created a lot of controversy. Earlier, similar statement was made by West Bengal CM Mamata Banerjee about the bright prospect of Telebhaja Shilpo, and most recently, the newly elected BJP CM of Tripura urged youths to set up Paan shops instead of wasting their time waiting for government jobs. The current article takes the essence of these comments as a starting point and inquires, given the nature of India’s economic growth and development, whether, such self-employment ventures are the only possible economic activities left for millions of aspiring job seekers. Dear reader, we will be happy to receive your feedback against this series. Read the previous article “The Travails Of Economic Growth” here. On Jan 19, 2018, in an interview with Zee News, PM Modi noted the following, “If someone opens a pakoda shop in front of your office, does that not count as employment? The person’s daily earning of Rs 200 will never come into any books or accounts. The truth is massive people are being employed”. This statement led to a furious back-and-forth of articles and memes supporting, ridiculing and criticizing Modi. But there is much to unpack in that statement of his. Do pakodas and street food not count as employment? Is pakoda selling not desirable and why? GDP, as an economic indicator, is expected to indicate the health of the economy and ostensibly the wellbeing of people in the economy, as we discussed in a previous article. The questions relevant for our common woman, Miriam, who has completed a college degree, are the following. Will she be employed as a result of higher GDP or economic growth? Is selling pakodas the only job available to her? Will this job result in a high standard of living for her and her family? In other words, we need to investigate two assumptions underlying the GDP fetish which we can pose as questions. First, does GDP growth always result in higher employment? And second, does employment always translate to a higher standard of living? This article addresses the first question and the next article will address the second question. Economic (GDP) growth = Higher Employment? Economic growth is considered desirable because it is assumed that it leads to higher employment. But does it? In order to answer this question for Miriam requires that we look at some economic data across time. Table 1 offers data for three time periods – 1983 to 1993-94, 1993-94 to 2009-10 and 2011-12 to 2015-16. India officially committed itself to economic reforms in 1991 in the form of liberalization. So this table compares the situation pre- and post-reforms. According to the table, in the time period after economic reforms 1993-94 to 2015-16, annual GDP growth rate was 6.8% and this was indeed higher than the pre-reform period growth rate of 5.2%. However, while annual job creation between 1983 and 1993-94 was 6.8 million, it was only 5.3 million in 1993-94 to 2009-10, and job creation declined to (-1.63) million between 2011-12 and 2015-16. In other words, higher economic growth in the post-reform period after 1993 did not result in higher job creation. And in more recent years, the economy has shed rather than created jobs. Some have referred to this as ‘jobless growth’. What this means is that Miriam would have had more success being employed before economic reforms rather than after. Further, even if she had been employed between 1993-94 and 2009-10, it is likely that the economy would have left her bereft of a job between 2009-10 and 2015-16. Let us categorize total employment into agricultural (which includes agriculture and allied activities such as fishing, forestry etc.) and non-agricultural sectors to understand which sector would have employed Miriam. In the pre-economic reform period between 1983 and 1993-94, annual increase in employment in the agricultural and non-agricultural sector were comparable. So Miriam could have been employed in either sector. However, between 1993-94 and 2009-10, the agricultural sector lost 0.1 million jobs annually, and between 2009-10 and 2015-16, the loss increased to 3.2 million jobs annually. So, if our friend entered the job market between 1993-94 and 2015-16, it is likely that she would have secured a job in the non-agricultural rather than the agricultural sector, notwithstanding differences in employment by gender. We will leave discussion on that issue for another article. This loss in agricultural jobs has been attributed to agrarian distress brought on by many factors including increasing debt incurred by medium-sized farmers, price volatility in the global market, declining government investment in irrigation and other agricultural infrastructure. Due to severe agrarian distress in India in the 2000s, a significant proportion of Indian farmers have committed suicide or are looking for alternative employment.This means that agricultural workers like Miriam’s parents who used to work in the fields of farmers in their village for the past 20 years also have had to look for other non-agricultural employment since 1993-94 along with Miriam. Conventional economic wisdom values the shift of workers from the agricultural to non-agricultural sector. This change in employment structure is viewed as a sign that ‘developing’ countries are making economic progress. India appears to be experiencing some signs of this shift – there are fewer jobs in the agricultural sector. However, the dismal rate of job creation in the non-agricultural sector has not made up for the loss of jobs in the agricultural sector leaving many older workers like Miriam’s parents as well as the youth entering the labour market with very few viable options. 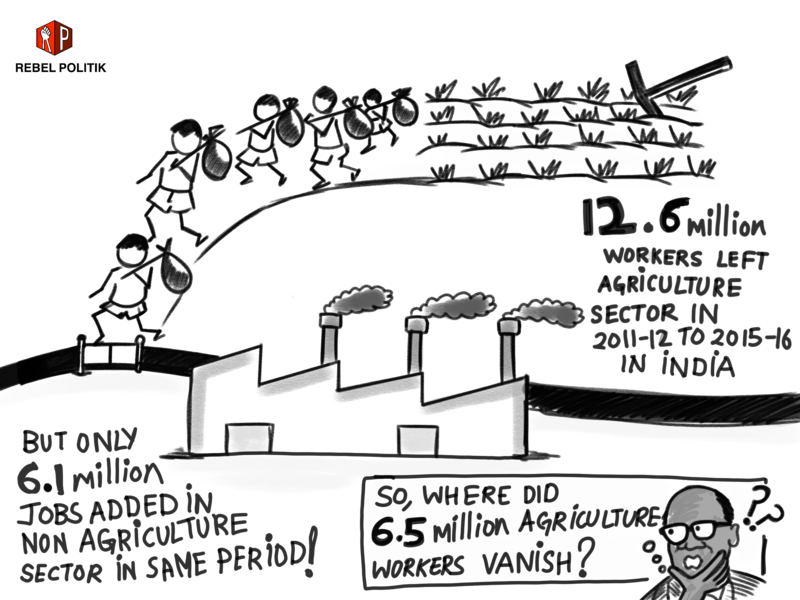 In aggregate terms, in the period between 2011-12 and 2015-16, there was a 12.6 million decline in agricultural workers but only a 6.1 million increase in employment in the non-agricultural sector. This resulted in a 6.5 million reduction of total workers employed in India during this period. Miriam and her parents would be interested in finding a job, but they, along with those interested in understanding the conditions of the working classes, would also be interested in knowing what kind of jobs they can hope to acquire. Understanding employment categories will help us understand whether pakoda sellers are counted among the employed or not, according to data produced by official statistical agencies in India. It will also facilitate our investigation of whether employment automatically offers workers a higher standard of living, as we will discuss in the next article. Based on data from official data agencies in India we can classify employment into the following categories. a) Regular wage workers consist of regular wage workers in the formal sector (registered enterprises subject to regulations) who are more likely to enjoy institutionalized benefits like employment, work and social security as well as regular wage workers in the informal sector who are not hired on a semi-permanent basis but do not enjoy benefits like those in the formal sector. If Miriam were hired as a permanent in a company and received a regular salary, she would be accounted for in this category. She would also be counted as a regular wage worker if she were to take up a job as a garment worker with lower non-wage benefits and a lower degree of employment, work and social security than a formal company job. b) Contract workers are hired through a contractor for a specific job and for a specific period and are considered indirect employees of the business. The data in Table 2 on regular wage workers for 1983 and 1993-94 includes contract workers. The proportion of regular wage workers plus contract workers only increased a dismal 4 percentage points from 16.4% to 20.7% between 1983 and 2015-16. Own-account workers who are self-employed in agriculture or non-agricultural work but do not hire others. These account for street vending, as well as the vast majority of farmers growing food. If Miriam were to start selling pakodas and chai on the street, she would be counted in this category. Contrary to Mr. Modi’s assertion that pakoda selling is not recorded in the official documents as employment, the National Sample Survey Organisation (NSSO), which is India’s official data collection agency, very much counts pakoda selling as precisely that. Unpaid contributing family members who work in the family business or farms without pay. If Miriam’s son washes the dishes after the customers are done with them, he would be counted in this category. Employers who are owners or operators of informal enterprises who hire others. These may be micro entrepreneurs whose income from participating in the informal economy is likely to be higher than others in the informal economy. If Miriam’s brother were to open a small restaurant and were to hire workers, he would fall in this category. Casual workers who have no fixed employer and negotiate the sale of their labour daily or for a season. Miriam’s mother who now carries sand as a construction worker and her uncle who works as a coolie are counted in this category of workers. Casual wage workers who are hired on a daily basis constitute more than 30% of total workers and this proportion has not changed significantly since 1983. All of the above employment categories, except regular wage work in the formal sector, are characterized by lack of protection against arbitrary dismissal (employment insecurity); lack of protection against accidents and illness at the work place (work insecurity); and lack of maternity, health care and other benefits etc. (social insecurity). In addition, these jobs are often associated with low wages. These jobs therefore offer little or no security and may also include bonded and forced labour. *includes data on contract worker. Source: Ghose (2015) and Gol (2016). Worker activity status based on usual principal status (UPS). Data in Table 2 sourced from official government data indicates that a very high proportion of total workers, nearly 47% in India are self-employed workers like our friend Miriam who now sells pakodas. Casual workers without any work, employment or social security increased slightly from 1983 to 2015-16. Regular wage work, even after high economic growth, only accounted for 17% of total workers in the country. It also means that at most 17% of total workers have some access to work, employment and social security. Economists across the political spectrum would agree that a low proportion of regular wage workers and a high proportion of casual wage and self-employed workers is undesirable for the Indian economy. In the next article in this series we will investigate whether these employment categories are associated with low or high income generation and poverty. But for now, let’s get back to Mr. Modi’s question – “If someone opens a pakoda shop in front of your office, does that not count at employment?” He posed this question as a challenge as if to imply that the data on the working population of India excludes pakoda sellers from its calculations. This is not true. India’s employment figures are not low because pakoda sellers, some of them selling excellent pakodas, are excluded in the data. Employment figures are low in the backdrop of high economic growth despite accounting for pakoda sellers. Or to put it differently, high economic growth has not resulted in high employment growth. Further, as we said we will discuss in the next article, to the degree that employment has increased in the nation, it has not transformed into better living conditions for Indian workers. Under the Modi government, the Ministry of Labour and Employment ceased collecting and publishing its annual employment-unemployment surveys in 2016, leaving no data on which to base economic and employment policies. If Modi were to revive data collection and spend some time with the data and credible economic analyses, perhaps he would not have to proffer seemingly deep but ultimately ignorant questions.